nice watches you are showing here. Movements are a PUW 560 (white face on a mesh) and Durowe 7420 (black face on a croco), right? I can add a PUW 1561 and an ETA 2801-2..............this weekend to be worn. Yes, I think so - Jorg did tell me once (a fair number of years ago) what the movements were. Wish I had an orange one, and I also tried to get a Piccolo (small KS for Ladies as my wife wanted one), but the price was too high. I have not seen any of these watches for sale for many years. Must now all be in collections like ours! Totally from memory I paid less than 300 euros for one of the Kleine Schauers, back when it was safe to buy off eBay. Its Saturday and I am going with this,my Stowa ProDiver with Carbon dial and 2824-2 Cosc movement! I love this watch,it does everything so well,keeps great time,easy to read and is beautiful to look at!!!!!!!!!!!!! flyingpicasso, kwcross, LambChopFamily and 7 others like this. Renisin, Emospence and highbob like this. 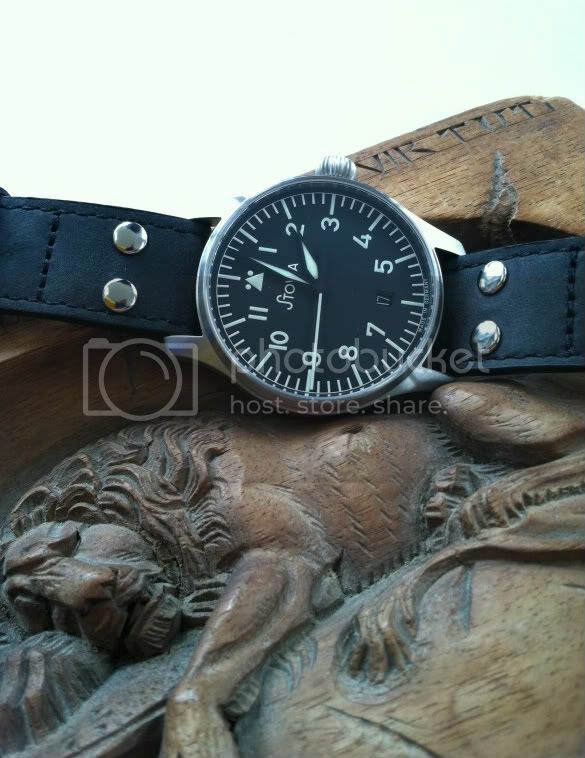 I really like that strap,it is great looking and gives your watch a rich feel,what kind is it? PS.I almost forgot,I am going to church so I going with this!! Last edited by Renisin; March 25th, 2012 at 14:46.
kwcross, Plälzer, Salome and 9 others like this. Renisin and highbob like this. I love that watch and strap combo, it is gorgous! Why just one more pic? It is nice to see all of these beautiful Stowas! Here is one of my latest I just had on for a morning walk. Plälzer, Renisin, Salome and 5 others like this. For the past hour or so I have been in my studio working on a project and I decided to show my new Stowa Prodiver. This is a great watch and it feels so good when it is worn loosely. Renisin, benbarren, tsimtcu8 and 2 others like this. Just one quick question, why post one picture when you can post lots more???? I love that watch,unique styling,reliable and a rugged movement that any watchmaker can work on!!! The lume is so bright that I have to wear sunglasses when I go to bed! It has been pointed out to me(in another thread) that Stowa uses generic movements in their watches. This is not exactly true,the 2824-2 elabore is the work horse movement in the watch industry, Swiss made and its Top movement is a pleasure to gaze upon! I found that comment to be arrogant and offensive! The Stowa ProDiver is one of the best values in watches today,bringing together the best of two worlds,Swiss and German watch ingenuity! Yes you could spend thousands more but what really are you getting for your money, over priced,over advertized,over the top watches that don't look or keep time any better! Not to be forgotten, if you do need service on your watch, being a Stowa it won't cost you an arm and a leg to get it fixed! This doesn't mean that I won't be buying other watches,what it does mean is that I am not so narrow minded or arrogant to think that one watch is the end all to all watches or anything else for that matter!! I really do like this watch and don't have to spend tens of thousands to get a watch nobody outside of WUS will recognize or appreciate!!! Last edited by Renisin; March 27th, 2012 at 21:08. Pawel_Korab, m0m0, mitadoc and 1 others like this.